It happens nearly every time my friends of mixed company (gender, race, marital status and sexual preference) are gathered around food, drink and fun times. What’s going on with the dating scene? When are you going to settle down (always pointedly asked by married women and men to single women and men)? In all of the years I have been single or in relationships, I can recall very few times when this conversation didn’t set off a debate on why or why not men and women choose to settle down. And for the most part, I stay quiet until the obligatory odd and outrageous comment reaches my ears. They range from the generally understood (I’m taking a break from dating since my last breakup) to the really outrageous and sad (I don’t date black men because they don’t marry their women). In all of these conversations, I came to the realization that most women believe in the Prince Charming myth- the man of your dreams will sweep you off of your feet and save you one day from the craziness of single life. You may or may not be wondering, ‘Why does it have to be a myth Ebony?’ ‘Are you bitter or jaded about relationships?’ I want you to first understand my thoughts behind my line of reasoning and what I have learned. -A Prince who is handsome, noble and possessing whatever other characteristics implying charm, ready to rescue somebody. Ladies – all of our Princes will be different from one another’s in some form or fashion and your list of Princely must-haves will be different from your girlfriends. Don’t compare the two and covet or fail to appreciate what works for you. Set your own standard. And make sure the standards you apply for him applies to yourself. Gentlemen – you don’t want someone who needs to be saved all the time.The Princess characteristics of being loving, sweet and vulnerable are of course appealing and worthy of rescue, but there is a point where those same characteristics cross the line into manipulative and thirsty behavior from the both of you. Come to the situation whole, not looking to “save” your other half. While everyone comes to a relationship seeking something – whether it’s companionship, traditional commitment, or some other reason; the relationships that last have one thing in common – the two people in them have decided that “this” is what works for them right now and they do not care what anyone else outside of “this” thinks about it. So going forward, instead of seeking Prince Charming in Shining Armor, I’m seeking MInd-Our-Business in Keeping-It-Together. 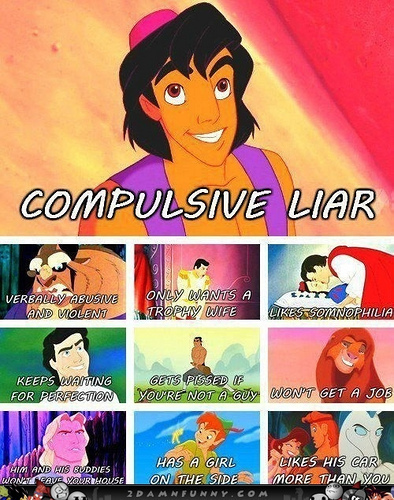 Found this Disney Prince Charming Personality breakdown- I love Disney! Things that interest me & thoughts that cross my mind. How many would you say makes a plethora?